Temporary Link to the previous version of this page. Many members will recall Life Member Bill Beaton as having had one of the largest and most varied radio and ephemera collections in Ottawa. 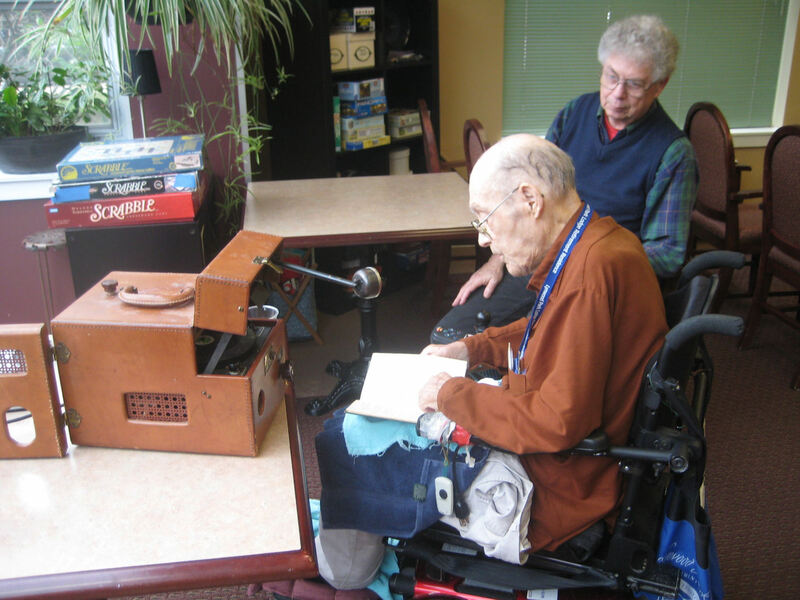 One of his items, a Sound-Scriber dictation machine, of 1950 vintage, was purchased from him by Lea Barker. An article on the restoration of this device is in the Spring, 2011 OVRC newsletter. Since Bill was also a collector of Robert Service books, and an expressive reciter of Service's poetry, Club President Paul Guibord and Editor Lea Barker took the opportunity on May 28, 2014 to record at Lynnwood Lodge Bill reciting the well-known "The Shooting of Dan McGrew." Because disks for the Sound-Scriber are almost unobtainable, your newsletter editor makes them from the clear plastic packaging on boxes of Christmas crackers. This material, thought to be low-density polyethylene, takes the embossing of the ultra microgrooves of the Sound-Scriber very well. Some of the quality of the original recording has unfortunately been lost in the quadruple conversion to MP3 (plastic disk to tape to computer to WMV to MP3); but it can be heard that the old recording machine still works well.